We interrupt this blog for Oliver + S!! - Stop staring and start sewing! We interrupt this blog for Oliver + S!! I'm so excited! My sweet Prince UPS stopped by again today and brought me a box filled with Liesl Gibson's long awaited Oliver + S patterns. These are so cute! I had the opportunity to sew a couple of them last week (the bubble dress, and the tea party sundress) for Liesl's trunk shows (which she mentions in the Oliver + S blog here). I highly recommend trying these patterns. They are simple but have some really neat techniques you don't find in your typical pattern. Very fun. 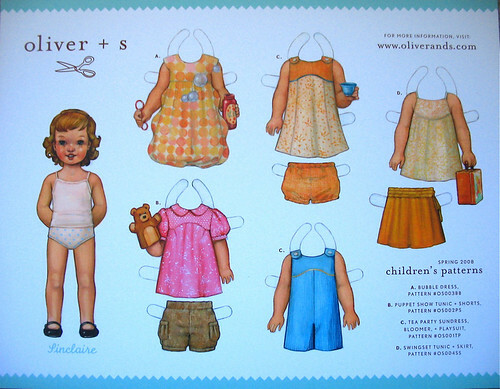 PLUS you get a paper doll and dress on nice card stock with each pattern! I'm selling them in my etsy store right now and the first 15 buyers get a beautiful complete paper doll sheet with all of the clothes in this collection. Oh, and be sure to join the Oliver + S flickr group if you make any of the dresses. Serious fun!